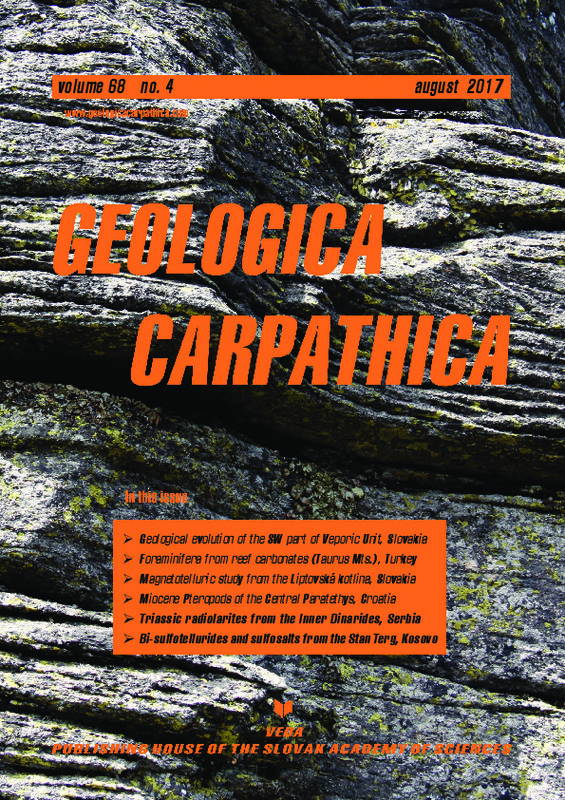 Abstract: Oceanic radiolarite components from the Middle Jurassic ophiolitic mélange between Trnava and Rožanstvo in the Zlatibor Mountains (Dinaridic Ophiolite Belt) west of the Drina–Ivanjica unit yield Late Triassic radiolarian ages. The microfacies characteristics of the radiolarites show pure ribbon radiolarites without crinoids or thin-shelled bivalves. Beside their age and the preservation of the radiolarians this points to a deposition of the radiolarites on top of the oceanic crust of the Neo-Tethys, which started to open in the Late Anisian. South of the study area the ophiolitic mélange (Gostilje–Ljubiš–Visoka–Radoševo mélange) contains a mixture of blocks of 1) oceanic crust, 2) Middle and Upper Triassic ribbon radiolarites, and 3) open marine limestones from the continental slope. On the basis of this composition we can conclude that the Upper Triassic radiolarite clasts derive either from 1) the younger parts of the sedimentary succession above the oceanic crust near the continental slope or, more convincingly 2) the sedimentary cover of ophiolites in a higher nappe position, because Upper Triassic ribbon radiolarites are only expected in more distal oceanic areas. The ophiolitic mélange in the study area overlies different carbonate blocks of an underlying carbonate-clastic mélange (Sirogojno mélange). We date and describe three localities with different Upper Triassic radiolarite clasts in a mélange, which occurs A) on top of Upper Triassic fore-reef to reefal limestones (Dachstein reef), B) between an Upper Triassic reefal limestone block and a Lower Carnian reef limestone (Wetterstein reef), and C) in fissures of an Upper Triassic lagoonal to back-reef limestone (Dachstein lagoon). The sedimentary features point to a sedimentary and not to a tectonic emplacement of the ophiolitic mélange (= sedimentary mélange) filling the rough topography of the topmost carbonate-clastic mélange below. The block spectrum of the underlying and slightly older carbonate-clastic mélange points to a deposition of the sedimentary ophiolitic mélange east of or on top of the Drina–Ivanjica unit.